Robert Jr. Whitall’s uniquely creative cover photographs for Big City Rhythm & Blues Magazine have been applauded for over the past 21 years. 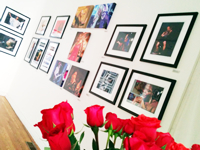 The photos he presented at “Women of the Blues” are a sample of his work focusing on women in the Blues. Whitall’s iconic photographs have been featured in Detroit music clubs, several gallery shows and CD covers. He is the publisher of Big City Rhythm & Blues Magazine. Through my beautiful wife, partner and favorite female photographer, I was privy to the Koko Taylor family and spent wonderful visits at the Queen’s house in Country Club Hills, Illinois, outside of Chicago. With Cookie’s help, (Koko’s daughter) we set up a photo shoot in Koko’s kitchen with her friend and Willie Dixon’s widow Marie Dixon. For one of the props, I found an alligator skull that we lovingly called “Bruce” and we got a lot of smiles from everyone. Koko’s love for Shirley Mae as she called her “My other daughter” made our visit and the shoot was a lot of fun. God bless you Koko! I took these two separate shots during the 1997 New Orleans Jazz & Heritage Festival. Bonnie was easy, I got on stage and was “hanging” by my legs on the stage scaffolding creating a great smile from Ms. Raitt. Marcia’s photo was a little harder, she was playing everywhere and I followed her from Jimmy’s to Tipitina’s to Jazzfest and finally at the end of one night I found her relaxing in the green room on a green coach at the House of Blues. It was worth the chase. Two beautiful pillars of American music. Australia’s Fiona Boyes, California girls­ Laurie Morvan & Roach, Koko Taylor’s daughter Cookie Threatt, Susan Tedeschi Trucks and up front California piano queen Taryn Donath. I took this portrait on the Pacific Legendary Rhythm & Blues Cruise in the port of Ensenada, Mexico. I gathered them around the ship’s bell ­ thus “Belles of the Blues” ­ “She could play her guitar like ringing a bell.